Accentuate your natural eye colour and give your eyes more depth. FreshLook Dimensions from Ciba Vision are soft, tinted monthly lenses for a radiant new look. 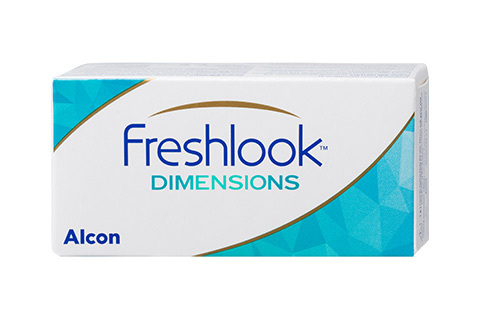 FreshLook Dimensions contact lenses give pale and muted eye colours a new shine. Mister Spex offers the light lenses in the following colours: Caribbean Aqua, Pacific Blue and Sea Green. FreshLook Dimensions are resistant to deposits and can, therefore, be used by people who have had trouble with other lenses in the past. The advanced production techniques and innovative design guarantee the best levels of comfort for the wearer as well as pin-sharp vision. FreshLook Dimensions are removed at night and stored in a care solution. That means every day you have the pleasure of fresh new lenses, for a clean and comfotable feel. FreshLook Dimensions are available without spherical correction, which means non-lens-wearers can enjoy a hot new look. In the Mister Spex online store you'll find FreshLook Dimensions at an unbeatable price. For even more great savings, take a look at our bundle offers including FreshLook Dimensions contact lenses and all-in-one solution. Mister Spex advises all online purchasers of FreshLook Dimensions contact lenses: the contact lenses, FreshLook Dimensions, should always be fitted to your eyes by an eye doctor or optician. The period between fittings, unless otherwise prescribed by an eye doctor or optician, should not exceed 6 months. You should go for regular check-ups. The manufacturer Ciba Vision/your eye doctor/optician's recommended wearing time for FreshLook Dimensions contact lenses should be followed strictly. It is your own personal responsibility to make yourself aware of the care instructions for FreshLook Dimensions contact lenses and to follow them accordingly. In case of eye irritation or visual impairments caused by FreshLook Dimensions, remove the contact lenses immediately and consult an eye doctor or optician. Damaged contact lenses should be replaced immediately.